The Education section is of primary importance in some ways since the driving force behind the original founding of the Centre and the Trust was the commemoration of the life of Ahmed Iqbal Ullah, the 13 year old Bangladeshi student murdered in a racially motivated attack in a Manchester school playground, 1986. The issue of race and education is an important facet of society, whether taking the form of the fight against school segregation in the Southern states of North America (Little Rock: Race and Resistance at Central High School, Karen Anderson), promotion of equal opportunity for all through policy and protocol (Action for Racial Equality in the Early Years, Jane Lane) or the British state’s at times inadvertent maintenance and legitimisation of racial inequality in schools (Equality and Inequality in Education Policy, ed. Liz Dawtrey et al). Many of the publications deal with the pros and cons of multicultural education and the efficacy (or otherwise) of anti-racist policy in schools. These range from critical working papers (The Rampton Report 1981: West Indian Children in Our Schools and The Swann Report 1985: Education For All), to books like Taking a Stand: Gus John Speaks on Education, Race, Social Action and Civil Unrest 1980-2005. Here, the devastating impact of racialised British politics on successive generations of White and Black Britons is discussed, emphasising how Black parents have a right to demand more from schools in the light of improving exam results from Black pupils. I think it’s important to remember that these pupils had to face racism daily and in an institutionalised form – in their textbooks, in staff attitudes to West Indian language, as well as in the playground. These were difficult decades and change could not happen quickly enough, but there is plenty of material to show that work was being done to rectify the situation, such as the 2003 report, Crisis of Black Underachievement in London Schools, where Saleh Mamon collects notes on how to develop a national strategy for closing the gap between Black and other pupils’ attainment. Britain’s diverse population has created bilingual and trilingual children and the education system has, over time, accommodated this. Books such as The Care and Education of Young Bilinguals: An Introduction for Professionals by Colin Baker deals with all the psychological, cultural and sociolinguistic aspects of bilingualism in one comprehensive guide. 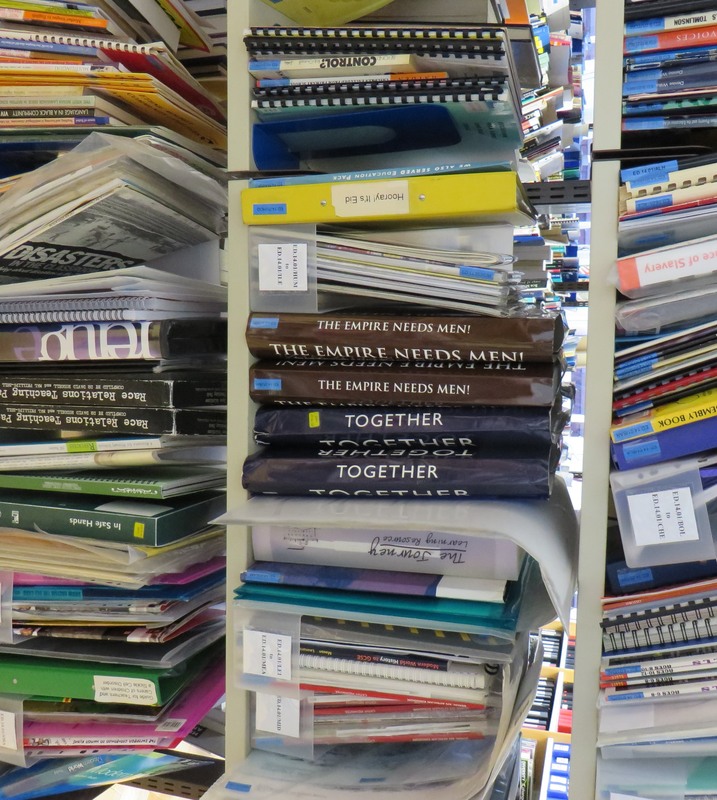 Some books touch on ‘codeswitching’ – the alternation between one or more languages or dialects, including within one particular language. Creolised language or pidgin is represented. Caribbean Literature: A Discography, compiled by Christine Keane and Julie Pearn, lists a live recording of a performance by Louise Bennett given at the Lyric Theatre in London in 1982 introduced by Linton Kwesi Johnson with lyrics mainly in Jamaican Creole. There are rare publications such as three small volumes of Jamaican folk songs, collected and arranged for schools by Olive Lewin, and many from independent publishers. 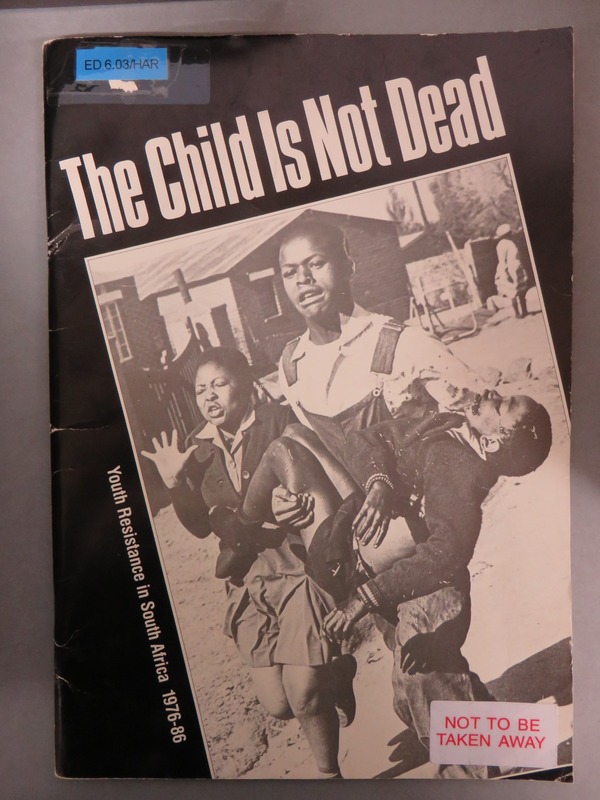 The Child Is Not Dead: Youth Resistance in South Africa 1976-86 from the British Defence and Aid Fund for Southern Africa features on its cover the iconic image from the 1976 Soweto Uprising of Hector Pieterson carried by Mbuyisa Makhubo after being shot by South African police, his sister Antoinette Sithole running beside them. The Soweto Uprising began as a protest by high school students concerning the imposition of Afrikaans as medium of instruction in local schools. 16 June is now a public holiday, Youth Day, in remembrance of what happened in 1976. At the far end of the Education section are numerous teaching packs, full of wonderful material that informs children about Black histories and Black heroes, complementing the range of Black hero and fiction books made in projects run with Manchester schools, published by our Education Trust. There is much to celebrate and enjoy here, while retaining a renewed awareness of the struggles of BME children against adversity. Overall, I can’t help but feel that the spirit of children and young people everywhere shines through. 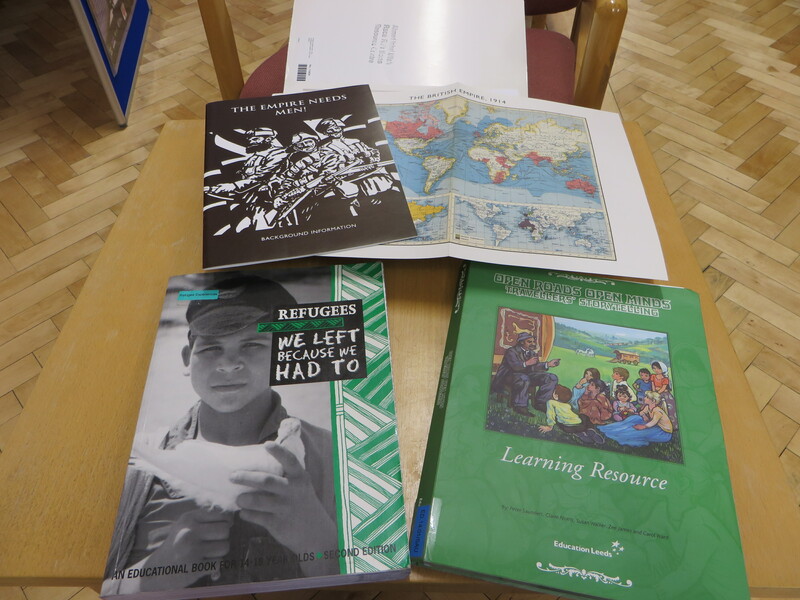 This entry was posted in Books etc, Our library and tagged anti-racism, bilingualism, children, education, library, multiracial education, schools, young people by aiucentre. Bookmark the permalink.